Welcome to the Bronx Climate Justice North Book Group! BCJN’s Book Group is many things – a social group, that allows us to know each other better and share hopes and concerns for our world; a reading group that chooses and analyzes some of the most important thinking and writing of our time; and a study group that grapples with the complexities of the climate crisis and the old and new movements rising to change its underlying causes. And BCJN’s Book Group is more – it is a BCJN working group that collectively ponders BCJN policies and actions. The Book Group makes recommendations to BCJN as a whole, to its other working groups (Energy Solutions, Food Justice, Green Vision), and to its steering committee. Please join us for study and analysis that inform our work and to forge closer ties among climate activists in the Bronx. For information about meeting times and locations, see below, or please email: bronxclimatejusticenorth@gmail.com. As with all BCJN meetings and events, our Book Group meetings are open to the public. July 1, 2017 UPDATE: Next BCJN Book Group Details Set! March 17, 2017 UPDATE: Next Book Choice and Date Set! For our next BCJN Book Group meeting — on Wednesday, May 17, 7:30-9:30 pm, home of BCJN member Mary Hemings (please email bronxclimatejusticenorth@gmail.com for address) — we’ll read This is an Uprising: How Nonviolent Revolt is Shaping the 21st Century, by Mark Engler and Paul Engler (Nation Books, 2016). February 8, 2016 UPDATE: Next Book Choice and Date Set! November 17, 2015 UPDATE: Next Book Choice and Date Set! September 8, 2015 UPDATE: Second Book Group Meeting Set! Our next meeting will be Wednesday, October 7, 7-9 pm. For the meeting location, please email bronxclimatejusticenorth@gmail.com, thank you. 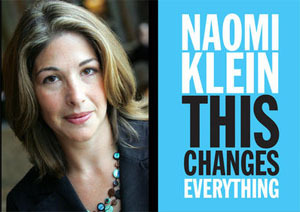 This will be our second and final discussion of Naomi Klein’s This Changes Everything: Capitalism vs. the Climate. We’ll choose our next book at the meeting. UPDATE: First Book Group Meeting Set! The first meeting of BCJN’s Book Group is scheduled for Sunday, August 2nd, 3-5 pm. For the meeting location, please email bronxclimatejusticenorth@gmail.com, thank you. The group has decided, by majority vote, to discuss Naomi Klein’s This Changes Everything: Capitalism vs the Climate, at our first and second meetings. The following books have been suggested by BCJN members for consideration by the Book Group. They are listed here in the order in which the suggestions were received. You will find an extensive list of books, articles, and videos on climate change, by subject category, at our Recommended Reading on Climate Change page.